Lawmakers gave first-round approval March 14 to a bill meant to address a shortage of qualified early childhood education teachers in rural Nebraska. 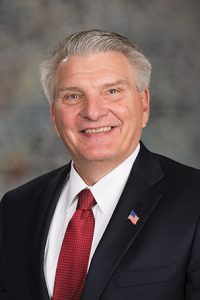 As introduced by Sen. John Stinner of Gering, LB803 would require that school districts offer full-day kindergarten programs beginning with the 2019-20 school year. It also would repeal a requirement that all teachers and administrators in prekindergarten programs hold a valid certificate or permit. Instead, the state Department of Education would be granted authority over teacher and administrator qualifications for those programs. An Education Committee amendment, adopted 34-0, replaced the bill’s provisions and would authorize the state Board of Education to adopt rules and regulations that exempt a prekindergarten program from the teacher and administrator certification requirement. Stinner said all early childhood education programs still would need to meet the board’s standards under its rules and regulations. As a member of the Buffett Early Childhood Institute’s early childhood workforce commission, Stinner said, he understands the need for quality in Nebraska’s prekindergarten programs, but he also sees the lack of certified teachers for those programs, particularly in rural areas. Sen. Mike Groene of North Platte supported the amendment, saying that it recognizes how difficult it is for early childhood programs in the state’s rural areas to find certified staff. It also would address a looming problem for the Head Start program administered by the educational service unit in Scottsbluff, which risks losing its federal funding if its teachers do not meet state certification, Groene said. Omaha Sen. Theresa Thibodeau also supported the amendment. As an early childhood educator and the owner of an early childhood development center, she said, it is hard to find certified teachers, even in an urban area. “I can imagine that it’s even harder in the rural areas,” Thibodeau said. Lawmakers voted 35-0 to advance the bill to select file.